One of the many beautiful sunsets from the back yard. 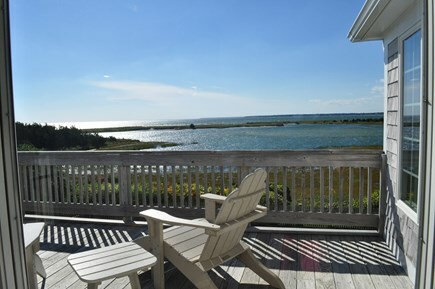 Have a glass of wine on the master bedroom deck. 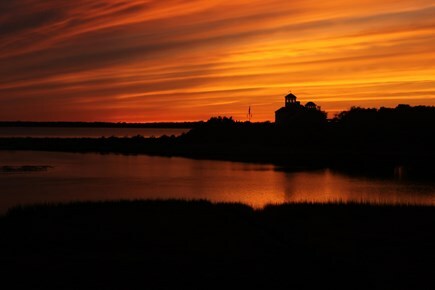 This 4500 square foot waterfront property offers the most amazing sunrises and sunsets. 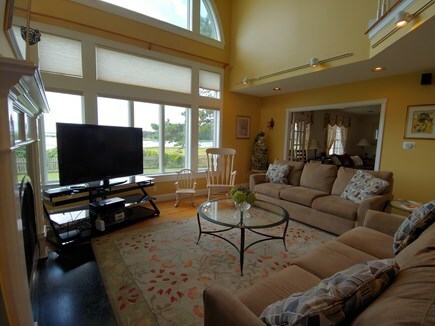 The oceanfront view is amazing, and you can see the ocean from every room in the house. 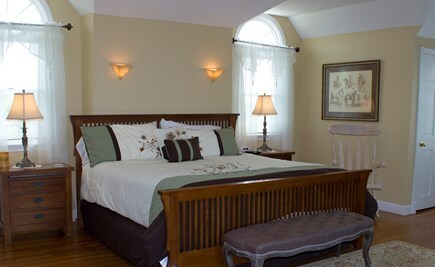 The master bedroom has a king sized bed with a sliding door leading out to a private deck, so that you may watch the sunset in a full state of relaxation after enjoying a bubble bath in the soaking tub. 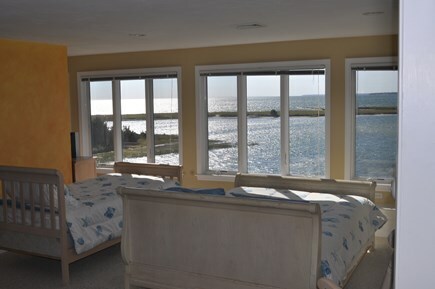 The second bedroom has a queen bed and is perfect for the person wanting to watch the sunrise over the water. 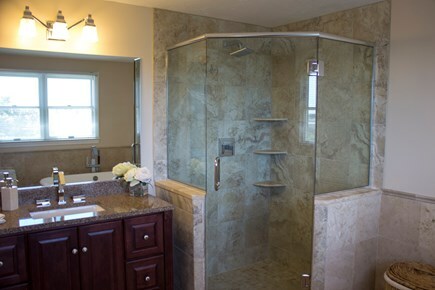 This bedroom also has a private bath with a Jacuzzi and shower. 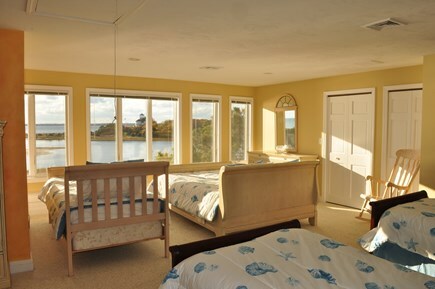 Bedroom three has a queen bed, and bedroom 4 has a king, both bedrooms with sunset views. 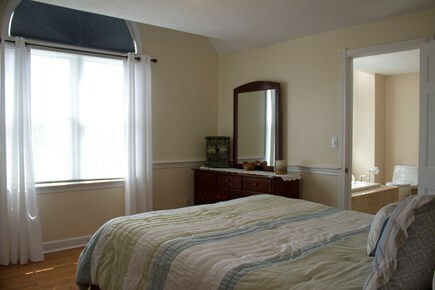 The third floor views are like no others with the Queen sized bed and four twin beds. 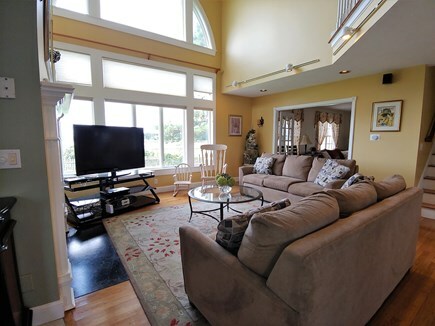 The family room has a vaulted ceiling with a massive window to look at the water views all day. 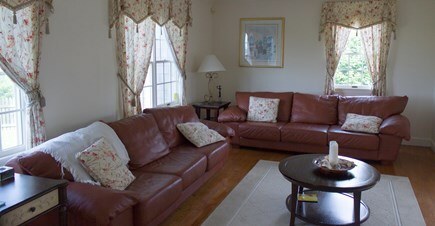 There is also a three season room, eating area, and outside deck to kick back, relax, and enjoy the views. 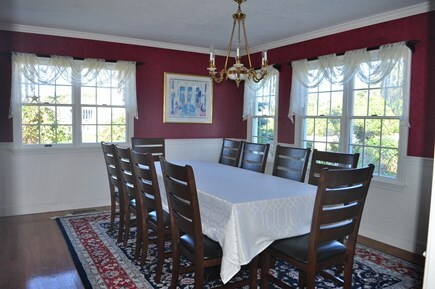 The formal living room with leather couches and dining room aren't excluded from the water views. The house features tile and wood floors. 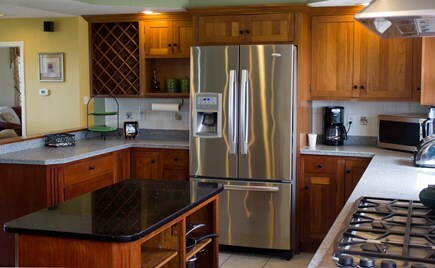 The kitchen features a six burner cook top and double ovens for the person that enjoys cooking. A gas grill on the back deck for a great family barbecue. 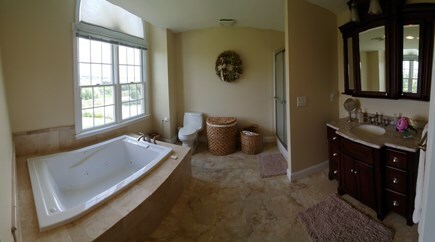 Four and a half baths. There is a fenced in back yard abutting the water. If you have a small boat, you can launch it from the private, neighborhood beach,'Little Beach,' about 30 yards from the driveway. 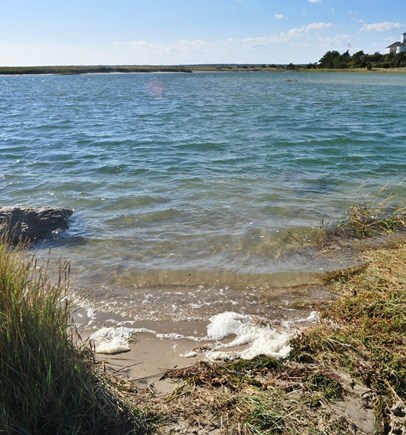 Bring your Kayak or canoe, and enjoy the ocean inlets. Fish or go crabbing from the jetty. 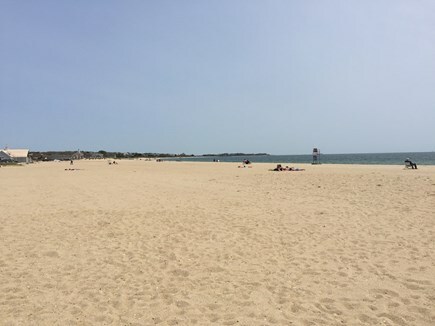 Craigville Beach is 1 mile away. The 'Avenues' are known for their great family atmosphere. Three miles from Main street with its many restaurants and stores. 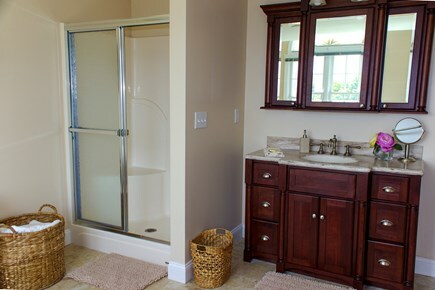 Additional pricing info: Cleaning fee $275, State and local taxes of 14.45% will apply. 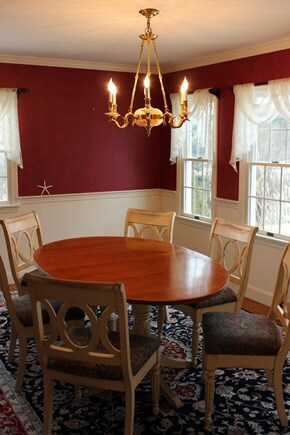 My husband and I have owned this house for over twenty years. We raised our children in it then decided that it is just too big for the two of us. We still go over there to enjoy the views and the sunsets but want others to be able to enjoy their vacation by the ocean. We are new to We need a Vacation, but have been renting out for five years and have all 5 star reviews (the highest rating). If you have any concerns please feel free to contact us through e-mail or phone and we will be glad to answer all your questions. 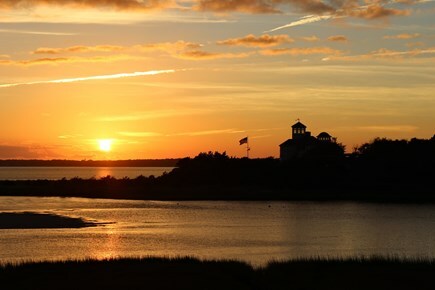 We live on Cape year round and want visitors to enjoy it as much as we do. There are lots of windows that allow me to see the gorgeous views. I get to sit with a cup of coffee in the morning and watch the Blue Heron catch their breakfast. 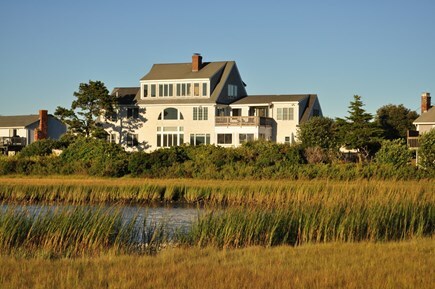 a ride to the National Seashore or historic Provincetown, explore Falmouth and Woods Hole, go four wheeling on Sandy Neck beach or have a restful day at Craigville beach and dinner on the back of the house. None of these destinations are more than an hours drive or boat ride.